Each time I hear the phrase “roots and wings” I get a warm, fuzzy feeling inside. In my mind, it’s a human ideal, a life best lived — having both a strong identity, sense of belonging, safe, stable place to retreat, in addition to a sense of exploration and a sort of fearlessness that’s driven by passion. Roots and wings idealizes a life well lived and steeped in joy. Of course, I want these idealized roots and wings — who wouldn’t. Really, to some extent, I have achieved roots and wings, but not in such a romanticized way. I have a supportive family and a sense of safety and belonging, knowing I always have a soft place to land. I also let life lead me and followed my passion of helping parents of kids with ADHD, and realized the dream of writing a book because of it. My life lacks some adventure and the carefree spirit I wish I could have, but I do have roots, and some baby wings. Isn’t this what every parent wants for their child, too? Roots and wings. A strong sense of family and belonging, knowing and accepting who they are, feeling supported and loved, and the life skills to take flight and follow their own path to success. I sure want that for my kids. I’ve worried for a long time that it wasn’t possible for my son, Ricochet. I wondered how you achieve peace, joy, and success when you have disabilities, like ADHD and autism, that make it so hard to fit in the world. Now I realize it’s all about the right parenting strategies, and a lot about positivity and compassion. Roots are the support and stability in this equation for fulfillment. By parenting with compassion and understanding, you provide your child with a safe place to retreat and a solid sense of belonging. That’s automatic. 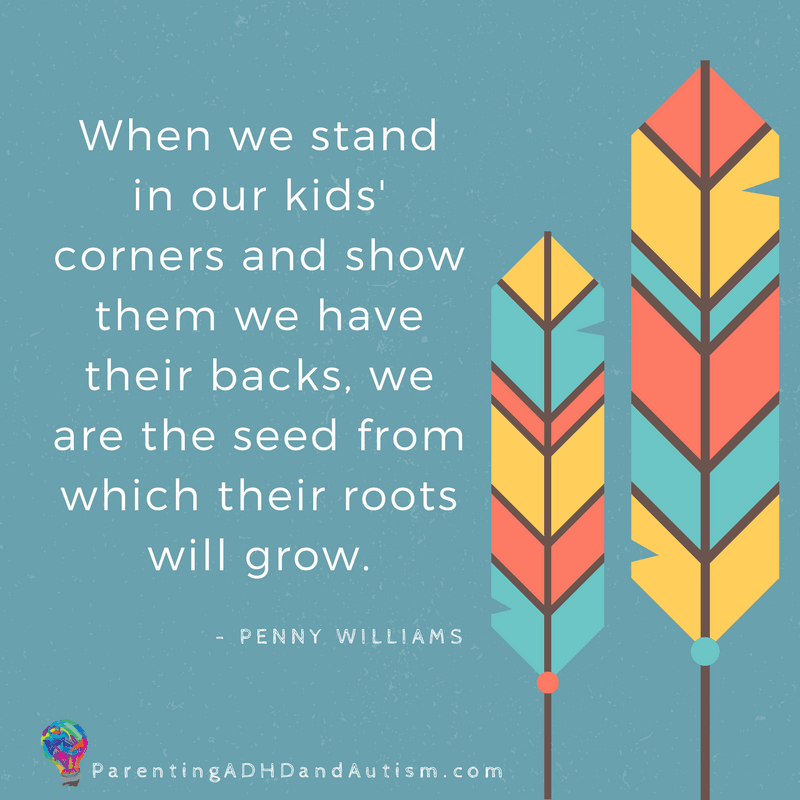 When we stand in our kids’ corners and show them we have their backs, we are the seed from which their roots will grow. When we calmly help them with intense emotions or a tough situation, we offer support. Implementing strategies to manage and work around ADHD/autism struggles provides scaffolding and external strength. Your child should sense that you are a soft place to land, a safe place to be their authentic selves, and a secure place to retreat. By offering all this stability and support, you are helping your child grow deep, thriving roots. It’s 100% possible for individuals with ADHD to achieve success and happiness — to soar. The journey may have more hurdles and stumbling blocks, but it’s absolutely, undeniably, unequivocally, totally possible. It’s just a different journey. The real joy for me is seeing my child soar. To know there’s opportunity at his feet and passion, confidence, and a sense of adventure propelling him forward. To see him succeeding with something. There are lots of ways we can give our children wings. Offering opportunities for successes by nurturing talents and interests is a big piece of that puzzle. It can be more difficult to find successes when you have ADHD or autism, so guiding our kids to areas where they can thrive and crafting opportunities for their successes is a crucial part of this special parenthood. Exploration and curiosity should be encouraged, as well. Think about it as though you’re setting the table for a family dinner. You need a sturdy table and chairs as the foundation (the roots). Then you need to provide dishes, silverware, and napkins. From there, your family feeds themselves. What if you don’t set the table. You provide the food (the nourishment), but you didn’t provide dishes and utensils to facilitate eating the food. Is everyone to use their hands and eat from the cookery? Wipe their mouths on the tablecloth? That doesn’t sound very successful, does it? It even sounds stressful. When we provide the tools and the nourishment, we set the table for success. The other element of giving our kids wings is fostering independence. It’s more difficult when you have a child who needs more help from you, but again, it’s totally possible. Instead of making decisions for your child and doing things for them (because, let’s face it, it’s often easier to just do it yourself), you must give your child more control of the little things to teach them how to control their destiny. I support my son in whatever his interest is at the time. Even when it’s gaming. Or creating his own YouTube videos. Or anything else that’s often frowned upon by the general parent population. I continue to champion him in his search for his wings. And all that time on YouTube may have payed off. He discovered digital music and has started composing and recording his own songs. He’s super into it, actually quite good at it, and wants to continue working on that endeavor, maybe looping in some secondary education in sound engineering. It’s a solid direction and it makes him happy now. He’s only 14, so it may not be his forever direction, but right now it’s giving him some beautiful wings.